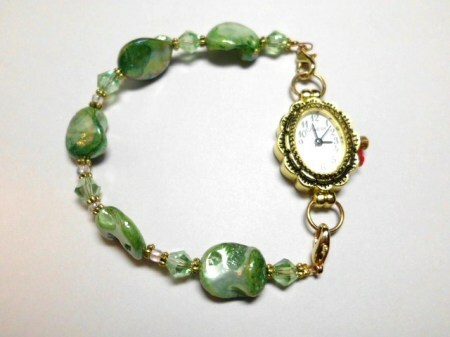 8" green mother-of-pearl and crystal gold watch bracelet. Luminous green nuggets of mother-of-pearl, sparkling green Swarovski crystals on a superbly detailed gold quartz watch. The Caribbean is calling wrapped on your wrist, it keeps on saying "Don't resist, don't resist!" Buy it now!